Many analysts have suggested that we are—yet again—seeing a bubble in early-stage investing. Their evidence: sky-high company valuations, an abundance of unicorns (private companies valued at over $1 billion), and a disconnect between public and private market views of early-stage companies’ worth. There may indeed be a bubble, and it may be getting ready to burst, but at least in the fintech sector, the market is far from saturated, and significant opportunities remain to create value. Let’s examine the evidence for a bubble and see how it stacks up against the opportunities in fintech. The bubble characteristics giving cause for early-stage investment concerns apply to the fintech sector as well: high valuations, including an abundance of unicorns, fueled by the rush of interested capital and accelerating buzz. 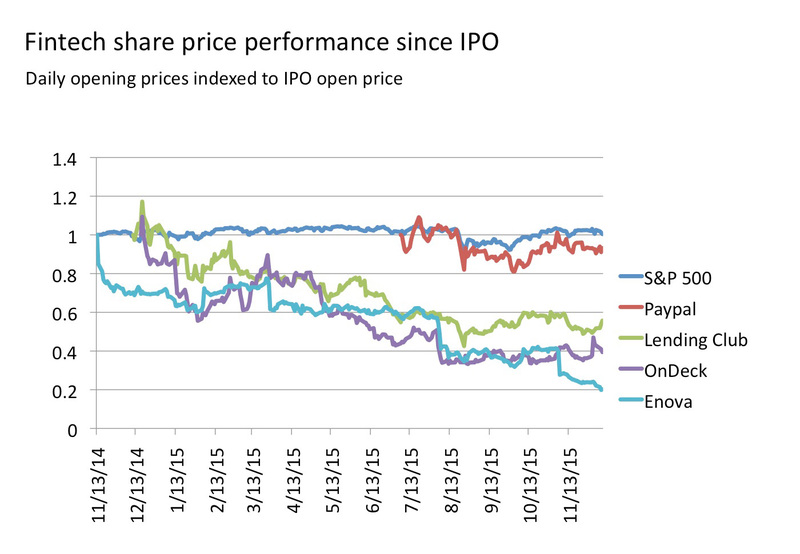 Valuations of early-stage fintech companies may be bubble-level high, if public markets are to judge. Of the 145 companies on CBInsights’ Unicorn Tracker, 17 (12%) are in fintech, making fintech the third-most represented sector behind eCommerce/Marketplace and Internet Software/Services. Square’s IPO highlights the enthusiasm-driven disconnect between private valuations of companies by venture and growth-stage investors and public market valuations at exit time. Though Square was able to raise $243 million, it did so at a $2.66 billion valuation—less than half that implied by the latest private funding round, at $6 billion. Figure 1. Chart courtesy of Hannah Granade and Matthew Granade. 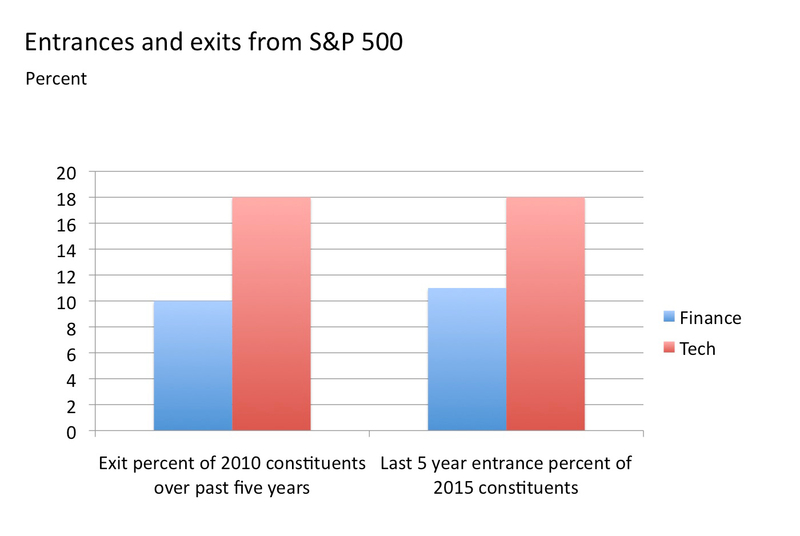 Data source: Yahoo Finance. Capital has certainly rushed into the sector as well—recent funding data show a marked uptick in fintech investments, reflecting both the underlying growth in total venture investment as well as a more than doubling in the share of venture investing allocated to fintech. Figure 2. 2015 annualized based on first 3 quarters of data and 20 years of quarterly data; 26.6% of annual investment occurred in the fourth quarter. Chart courtesy of Hannah Granade and Matthew Granade. Data sources: PWC MoneyTree / NVCA. New entrants to the fintech investing space include an abundance of corporates, as large incumbents seek to buy up attackers, and newly founded venture firms and incubators/accelerators. CB Insights reports a four-fold increase in the number of venture investors in fintech since 2010. 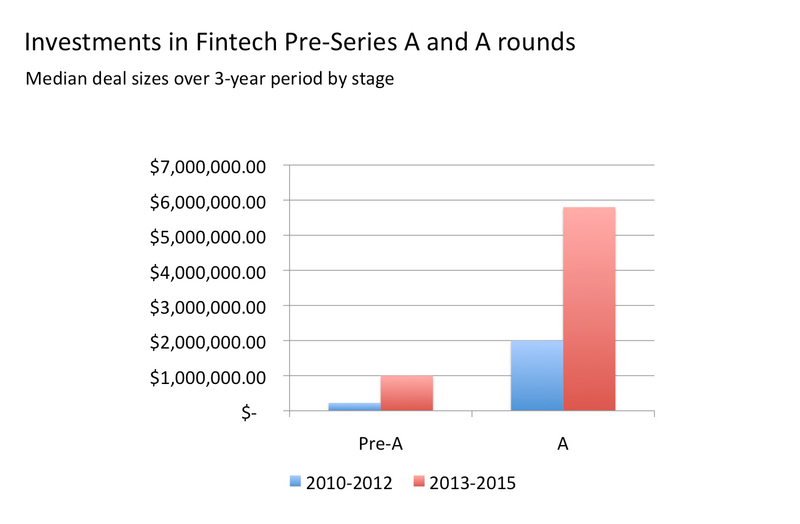 The size of recent investments in pre-Series A and A rounds has also grown significantly. Median fintech deal size over the time period 2010-2012 was $225,000 for pre-Series A rounds, and $2 million for Series A rounds. By contrast, median fintech deal sizes from 2013-2015 were $1 million and $5.8 million for pre-Series A and Series A rounds. Figure 3. Chart courtesy of Hannah Granade and Matthew Granade. Data source: Mattermark. Taken together, the valuations and capital influx could give cause for concern that fintech is ready to pop. 1.Enormous market cap remains to be taken. 2.There actually hasn’t been that much innovation yet. 3.Plenty of white space remains. The collective market capitalization of the financial firms in the S&P 500 is ~$3.2 trillion, the second biggest sector represented in the index, behind tech at ~$4 trillion. The relative magnitude of opportunity is significant and comparable with the sector that has been the archetype of innovation for the past several decades. Figure 4. 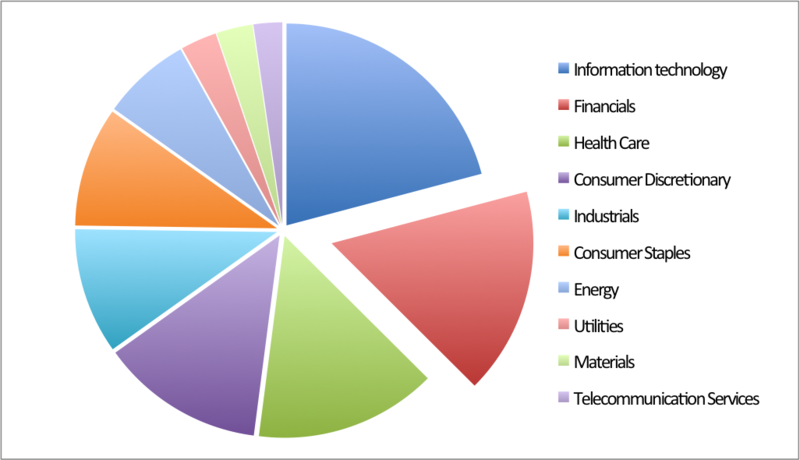 S&P 500 market capitalization by sector. Chart courtesy of Hannah Granade and Matthew Granade. Data source: Standard & Poor's. Chart courtesy of Hannah Granade and Matthew Granade. Data sources: Wikipedia, MarketCapitalizations.com. Even with the $48 billion in private market cap represented by the financial unicorns, the remaining potential opportunity is enormous and ripe for disruption. 2. There actually hasn’t been that much innovation yet. Consider the innovations of social media companies like Facebook and Twitter—these companies have created whole new ways of interacting. Entirely new arenas for social connection have also brought with them new ways of communicating—our very speech has become pithier. Other innovators like Apple have reinvented the music industry and changed the definition of phones. By contrast, the new entrants to finance largely follow a much more tried-and-true formula: lower costs or better customer experience (or both). The core of fintech innovation is reminiscent of the changes online retailing brought to the traditional bricks and mortar segment. Software is less clunky, information is available in real time, and less effort is required to obtain what you want. Financial services are moving online and with less paper. With the exception of the invention of blockchain—a tremendously exciting innovation that we have yet to figure out how to use—fintech attackers have gone after rather low-hanging fruit. These new entrants are hardly earth-shattering in their inventions—but their offerings are very valuable, and they’re indicative of how poorly served customers are by incumbents. Witness Zenefits’ soaring growth—they’ve acquired 10,000 customers in just 18 months. These companies tap into underserved customers, like Zenefits does, or entirely unserved customers (like Square does) with their relatively simple value propositions. Long before the truly futuristic must be tapped, many companies will be able to launch significant businesses by merely doing the basic. 3. Plenty of white space remains. Disruption in fintech somewhat resembles a high school cafeteria—swarmed around a few popular areas, sparse across the rest of the landscape. 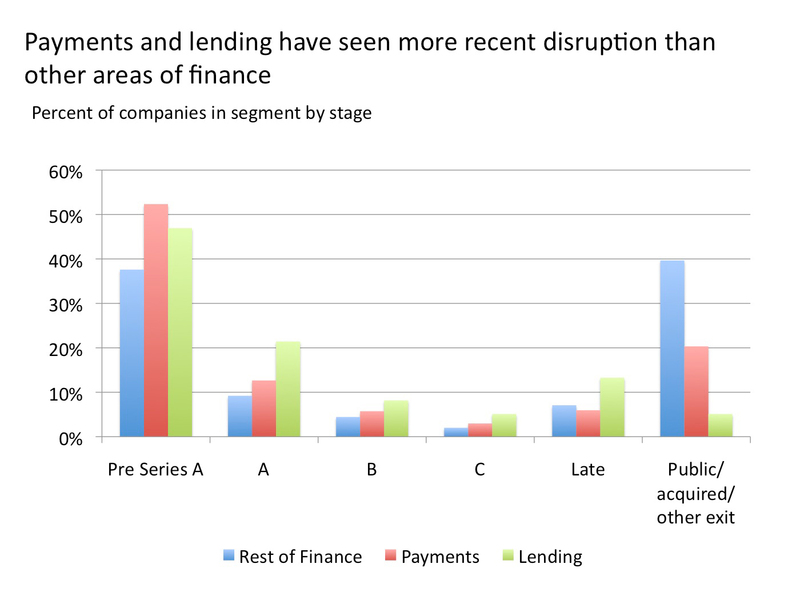 New companies have been fairly concentrated in two areas: payments and lending. Figure 6. Chart courtesy of Hannah Granade and Matthew Granade. Data source: Mattermark. Despite its massive size and variety, insurance has yet to attract many new entrants with only a few notable exceptions (Zenefits, Oscar). Investment banking remains a business with high fees and little new competition, largely handled through relationships and high-touch businesses. Accounting and most other business financial services (e.g., collections, accounts receivable management, audit, credit rating) have also held to traditional models and human-driven processes. The underlying financial infrastructure has yet to be approached—no attacker has yet given CHIPS (Clearing House Interbank Payments System: the bank-owned, privately operated electronic payments system founded in 1970) a good run for its money. CHIPS transfers funds and settles transactions, handling about 240,000 transactions per day with an average daily value of $1.2 trillion. 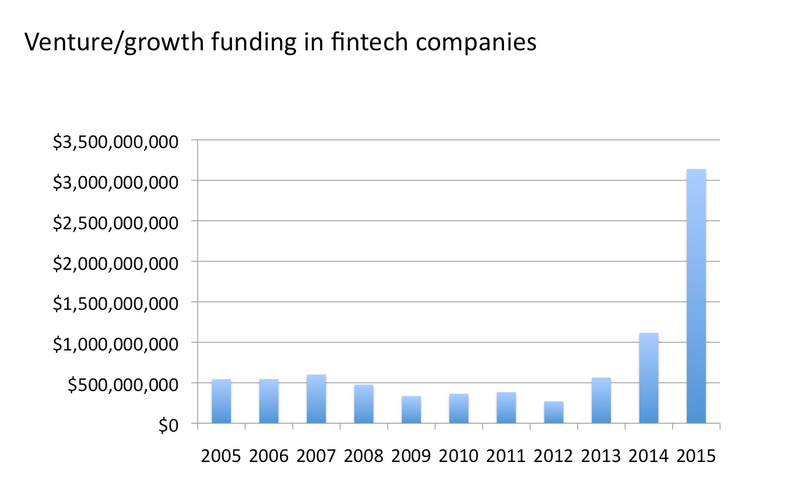 Rather than a criticism of fintech, evidence of the sector’s infancy is good news. For the past several decades, innovation in finance has meant, very narrowly, the advent of new financial instruments—derivatives of increasing complexity, or new ways of bundling cash flows or risks—as opposed to opening up new markets and business models. And while some of those have improved access to capital and efficiency in markets, serious innovation potential remains to improve the customer experience in addition to reducing the costs and hassle of financial interactions. So, forget the bubble and break out the bubbly—this party’s just getting started. Article image: "A Toast," by August Hermann Knoop, 1919. (source: Wikimedia Commons). Hannah Granade is a tech entrepreneur, currently building a fintech startup in stealth mode. Previously, Ms. Granade served as CEO and President of Advantix Systems, a private equity-backed industrial technology startup. Prior to joining Advantix, she was a partner at McKinsey & Company, where she spent a decade advising leading companies on issues of strategy, finance, and regulation. Ms. Granade was named one of the “100 most creative people in business” by Fast Company. Ms. Granade earned an AB from Harvard University.